MGPR is a non-profit Virginia corporation that rescues, rehabilitates, and finds new homes for guinea pigs in the DC, Maryland, and Virginia area. We also work to educate the public on the proper care of guinea pigs. Metropolitan Guinea Pig Rescue is recognized by the IRS as a 501(c)(3) nonprofit organization and is registered with the Virginia State Corporation Commission as a charitable corporation. As such, all donations are tax-deductible. To make a donation, please visit our Donations Page. Hay! 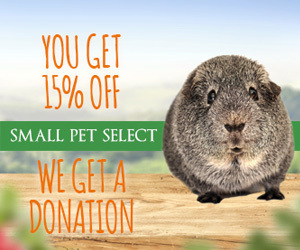 We're part of the Small Pet Select Rescue Affiliate Program. You make a purchase; we get a portion of the sales. Check out their products. Make sure to read the instructions on how to get the discount.